Legendary Wu-Tang rapper Ghostface Killah has a few projects coming down the pipeline, but while fans are no doubt chompin' at the bit to hear his Supreme Clientele Presents... Blue & Cream: The Wally Era or his Sheek Louch collab Wu-Block, the most-anticipated project is without a doubt his long-gestating DOOM/Starks project Swift & Changeable with masked producer DOOM. Turns out the Wallabee champ is also frustrated at the wait, which he explains is because DOOM has up and left New York for London. "Whatever he doing in Europe, nah mean, he's over there," Ghost revealed to Fast Forward Weekly. 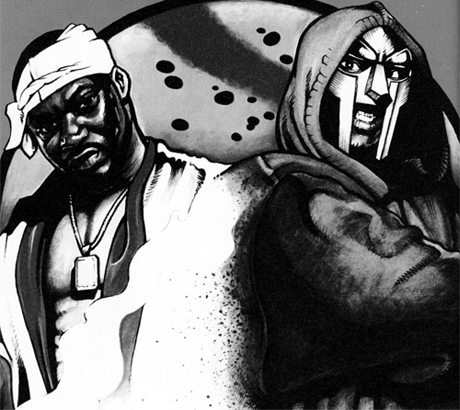 According to the rapper, they have worked on a bunch of tracks, as evidenced by the recently released "Victory Laps" single, but he's currently waiting for DOOM to hit him up with some more beats. "I told him, I said, 'Yo, just send me more tracks. Get it to me so we can narrow it down. That don't mean whatever we got, we have to use. Yo, come on, let's just do it. I can't wait to do the DOOM album. Everybody looking for the DOOM album." It's unclear if and when the project will come to light anytime soon, but thankfully Ghostface apparently has even more work on the way. The interview revealed that the Ironman is going to get back together with his Wu brothers for RZA's upcoming kung fu flick The Man with the Iron Fists. "Me and RZA spoke about it," he offered. "You know how you score a movie? We thought we might as well make the Wu-Tang album the soundtrack. That made more sense to me." A release date for the film has yet to be announced, but it is expected sometime next year.